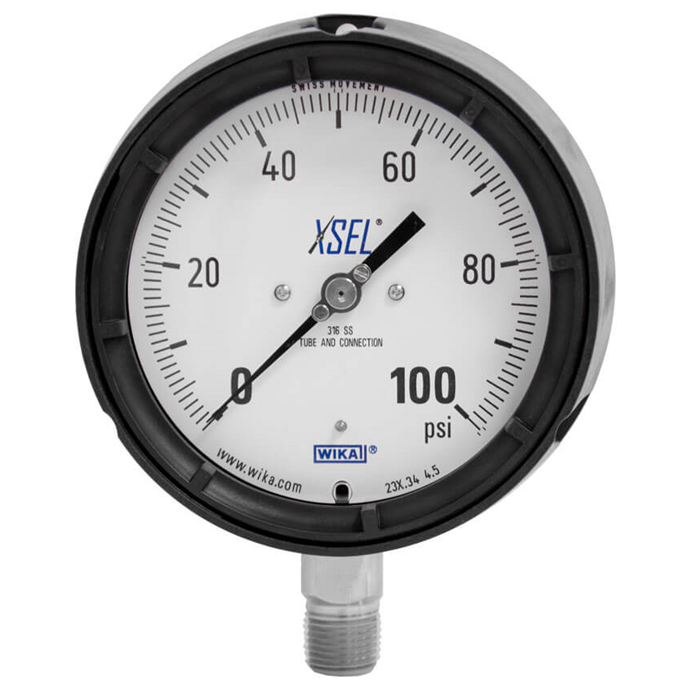 This high-quality Bourdon tube pressure gauge has been designed especially for increased safety requirements within the process industry. By using stainless steel materials for the wetted parts and also a highly resistant plastic for the case, the model 232.34 achieves excellent corrosion resistance. With this, the instrument is ideal for liquid and gaseous media, even in aggressive environments. Scale ranges of 0 ... 0.6 bar to 0 ... 1,000 bar ensure the measuring ranges required for a wide variety of applications. WIKA manufactures and qualifies the model 232.34 in accordance with the requirements of the American standard ASME B 40.100 in the safety version. The safety version is made up of a non-splintering plastic window, a solid baffle wall between measuring system and dial and a blow-out back. In the event of a failure, the operator is protected at the front side, as media or components can only be ejected via the back of the case. For harsh operating conditions (e.g. vibrations), all instruments are also available with an optional case filling.